54cm stainless steel freestanding cooker is rated 4.3 out of 5 by 19. 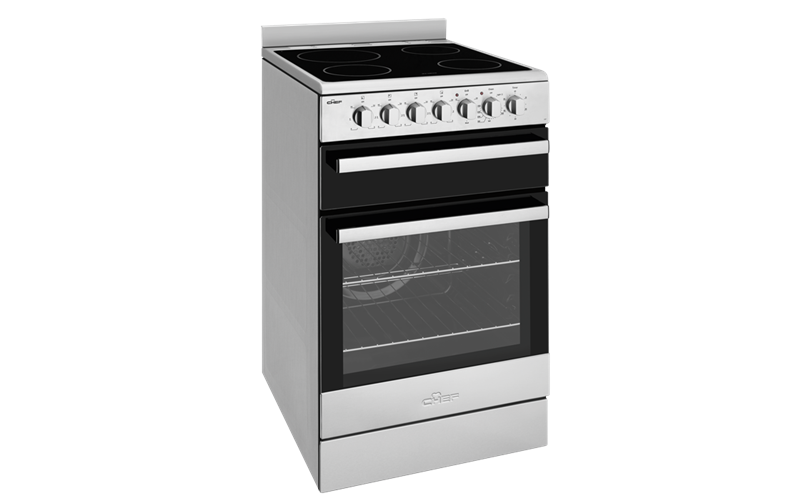 54cm stainless steel freestanding cooker with fan forced oven, timer, light, separate electric grill and electric hob with ceramic glass. Rated 5 out of 5 by jennan1 from Love the way it coooks evenly! Purchased this Oven last month. It is nice and compact and fits the space well. It cooks evenly with the Fan Force Oven and love the fact that there are no loose side runners in the oven as the runners are moulded into the wall of the oven. Makes it much easier to clean. Rated 5 out of 5 by Han1991 from Better than I expected! I was initially sceptical when buying another electric oven, however the Chef 54cm Freestanding oven cooks beautifully and gets hot fast! I'm really glad I bought it. Installation and removal of my old oven was so easy with Appliance Online's affordable fee. Rated 2 out of 5 by NaomiBirkett from Surface has discoloured after 2nd use. I purchased this oven which works very well, however the black under the glass cooktop started to discolour, as if it's flaked underneath, after the second use and it already looks like I've had it for a year. a bit disappointing. Rated 4 out of 5 by Bernice M. from I'm still getting used to it - so can't rate it excellent at the moment. If there was a very good I would say that. Visibility to the grill is poor so getting the grill tray back into place is tricky.